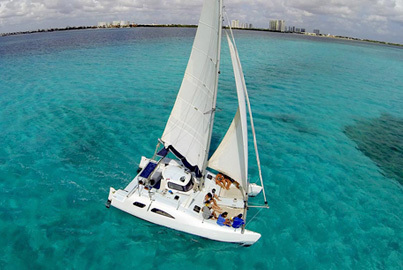 The best catamaran rentals in Cancun. 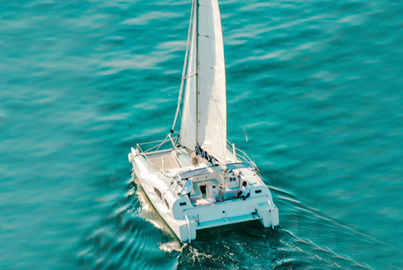 Get discounts, offers, and packages for your catamaran rental and charter in Cancun & Isla Mujeres. Fulfill your taste and budget with our hand-picked selection of private catamarans Cancun that meet the highest standards of quality in equipment, amenities, and service. Control every aspect of your private catamaran cruise, all comes down to your desires. As the service is private, your itinerary is flexible and the crew will adapt the tour to your personal preferences. Relax on a perfect private catamaran tour, no crowds, just you and your family or friends. Perfect chance to spend quality time with your favorite people, and create a special bond with your loved ones. 32 ft Catamaran for up to 13 people. 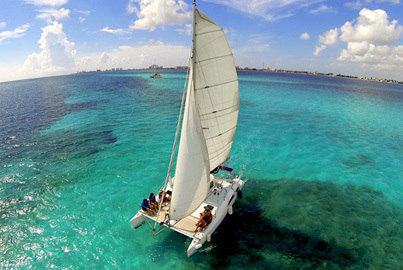 Hourly or full day catamaran charter in Cancun. As this is a Cancun private catamaran rental, you are free to decide the whole itinerary and route, options are endless: Isla Mujeres day cruise, private Cancun sunset sail, Cancun catamaran booze cruise & party boat or just a catamaran ride. It's worth to mention the catamaran is equipped with snorkeling gear, in case you want to dip into the reef. Ideal for small groups and perfect to spend quality time with your favorite people. Roundtrip transportation from any hotel or hostel in Cancun. Courtesy stops to get snacks or extra drinks before boarding. You're free to get drinks and food on board without extra charge. 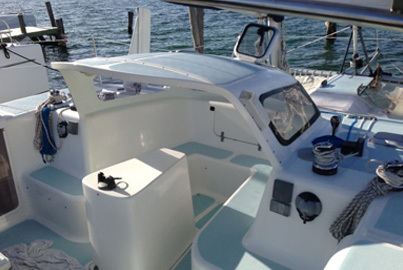 32 ft. private catamaran sailing for 4 or 7 hours (according to your selection). Domestic open Bar onboard (Rum, vodka, whiskey, tequila, beer, ). Snorkeling Equipment (life jacket, mask, snorkel tube, fins). Music on board (you're allowed to plug-in your mobile). Free time in Isla Mujeres. For full day (7 hours) catamaran rentals, free buffet lunch with delicious regional dishes is included. Roundtrip air-conditioned transportation from Playa del Carmen and Riviera Maya is available for $15 USD per person (payable when picked up). Bring swimsuit, sunglasses, biodegradable sunscreen, dry clothes, towel and cash for personal expenses. 4 hours catamaran rentals : 10:00 AM and 2:30 PM . 4 Hours sunset cruise and 2 hours sunset sail: 6:00 PM. Bad weather warranty (full refund): If there’s seaport closure (bad weather), enjoy your catamaran cruise another day or if you prefer your money back. For 4 hours catamaran charters, we can add extra hours for $170.00 per hour upon request.